Franklin TN's most reliable fence installation and repair company. Local fence contractor, Franklin TN Fence, offers a beautiful array of wood fences for your Franklin home! There is nothing better looking than a high quality wood fence to really set your house apart. Wood fences come in a variety of styles and colors. All of our wood fences can be custom designed to fit your property and aesthetic/design needs. Today’s wood fences are built to last for many years with minimal maintenance. 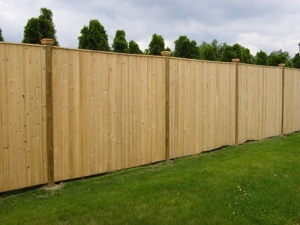 We specialize in installing wood fences in the Franklin, TN area. We understand that there are many fence contractors in Franklin and appreciate you taking the time to consider us for all of your local fence contractor needs. We have many years of experience and our goal is complete Customer Satisfaction, from beginning to end. We understand and strive to offer the best wood fencing available today, designed and installed just for you. Whether you want wood fencing for property line marking, for safety, or for improved curb appeal, our fence professionals will help you choose the best option for you. Click here to view our Wood Fence gallery.